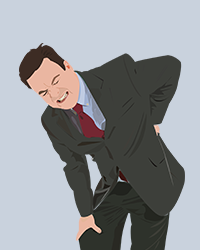 According to studies, back pain is the most common cause of disability in Americans younger than 45 years. Each year, 3-4% of the US population is temporarily disabled, and 1% of the working-age population is totally and permanently disabled. Back pain has been cited as the second most frequent reason to visit a physician for a chronic condition, the fifth most common cause for hospitalization, and the third most frequent reason for a surgical procedure. Back pain of all sorts can be caused by injuries to several pain-sensitive structures, which include the disk, facet joints, spinal musculature, and ligamentous support. The pain can also vary; being described as dull, aching, sharp, shooting, throbbing, burning, traveling, and pressure-like. If you are having back pain of any kind that doesn’t resolve by itself in a couple of days, it is best to seek a back specialist to find out whats causing the pain and what can be done about it.